Here we saw different ways to get hold of a Type. You can use the Type object to extract different ingredients of a class such as methods, properties, events etc. through various methods. 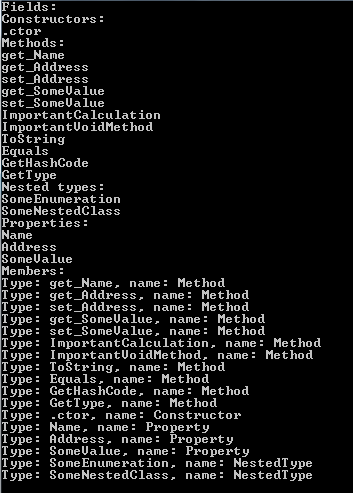 The name of the object that these methods return ends with “Info”, like FieldInfo, MethodInfo etc. These Info classes all derive from the MemberInfo abstract base class. The Type object also derives from MemberInfo. We have a field called _name but it wasn’t picked up by the GetFields method. That’s because it’s a private variable. If you want to extract private fields and members then the BindingFlags enumeration will come in handy – we’ll look at that in a separate post. The default behaviour is that you’ll only see the public members of a class. This is true for both static and instance members. Another base class which is important to know of is MethodBase which also derives from MemberInfo. It represents any member that can contain a body: constructors and methods which in turn are represented by ConstructorInfo and MethodInfo.